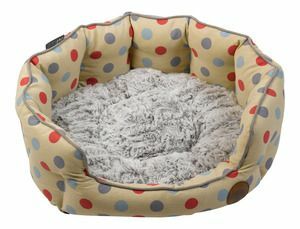 These luxurious beds by Petface have a polka dot pattern throughout with a super soft faux fur removable inner cushion and are perfect for your pet to relax in. Colour: Beige with Blue & Red Polka Dot Pattern and Grey Faux Fur. Material: 45% Polyester, 42% Cotton & 13% Viscose Outer Fabric with 100% Polyester Faux Fur Cushion & 100% Polyester Fibre Filling. PLEASE NOTE - these beds are not indestructible and may not be suitable for dogs or puppies who are likely to chew their bedding.